As an investor, I felt a little relieved when October is finally over, especially when all three major indices closed the month with two consecutive gains, which is a rare event these days. What is not rare the past month are the huge ups and downs of the indices, especially the Dow Jones Industrial Average. As I remember in the past, people could be excited when the Dow had a triple-digit gain or loss because it didn’t happen very often. But not now. 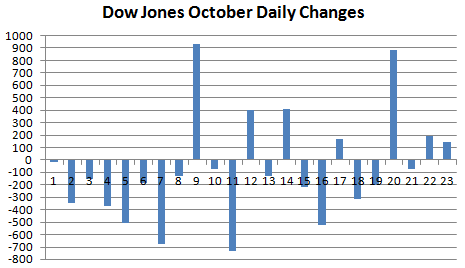 According to my count based on the historical data of the Dow, in October 2008, there were 20 days when the benchmark’s daily change exceeded the 100-point level and there were only 23 trading sessions. To give you an idea how big this number 20 is, take a look at what happened in 2007 and 2006. In 2006, there were 33 trading days when the Dow gained or lost triple-digits; in 2007, that number grew to 78, 55 of which were after July 1 when the sub-prime loan triggered financial crisis started to explode. So far in 2008, we already have 117 such days, 35 in the past two months. Talking about volatility, I don’t know if there was any period of time in the index’s history when it had such big swings almost every day. In addition, two biggest losses of October ranked 2nd and 4th on the all-time biggest drops list (point wise) while two largest gains of the month were also among the largest gains of the index. So what the month of October has done to us? Wait until I post my monthly net worth update tomorrow. It’s very, very ugly if you want any hint now. Indeed, October is a month that everyboy wants to forget. It seems like everyone’s been talking about the VIX volatility index lately given all this insanity… I’ll be glad when I can pretend 10% annual gains isn’t a silly pipe dream.